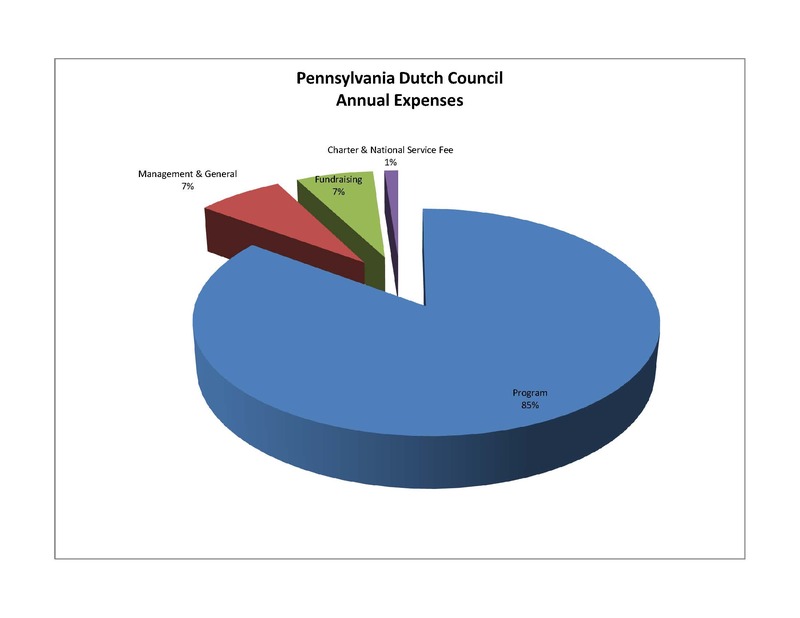 The annual operations of the Pennsylvania Dutch Council, requires support from many sources. Many of these sources are the result of direct fundraising, such as Friends of Scouting, Special Events, and Project Sales. Other support comes from donors to the annual United Way Campaigns in both Lancaster and Lebanon Counties. Below are a couple of graphics that show the sources of support & revenue for the annual budget as well as how the Council spends the dollars that are giving or raised in the name of Scouting. For more detailed information visit the other fundraising pages on this site or view our annual report, which is also on the site. We are grateful and thank all of our supporters no matter how they chose to support the mission of Scouting. If you would like specific information on how you can support a specific project or have questions please contact Tade Sullivan, Development Director at 717-553-4207 or tade.sullivan@scouting.org.